The American Association for Cancer Research (AACR) has released its 2015 Annual Report, titled “Bringing Cancer Discoveries to Patients.” This theme emphasizes the critical value of each step along the cancer science continuum, from basic discoveries to translational advances to clinical treatments. 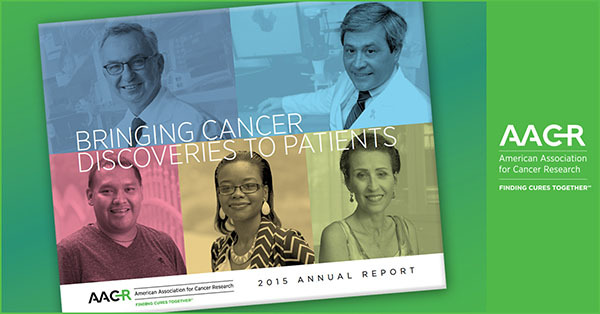 The report highlights the AACR’s progress over the past year as we worked toward our mission: to prevent and cure cancer through research, education, communication, and collaboration. It features updates from all divisions of our organization, news on the year’s major developments in cancer research, and a look ahead to some of the initiatives that could further advance our mission in 2016. Cancer is a complex disease, and achieving our goal of preventing and curing it requires a concerted effort from all corners of the cancer research community. We are proud to showcase the efforts of our 35,000 members as we work to improve the lives of cancer patients. The report is available online and in a PDF version; while supplies last, print copies may be requested by emailing aacr@aacr.org.